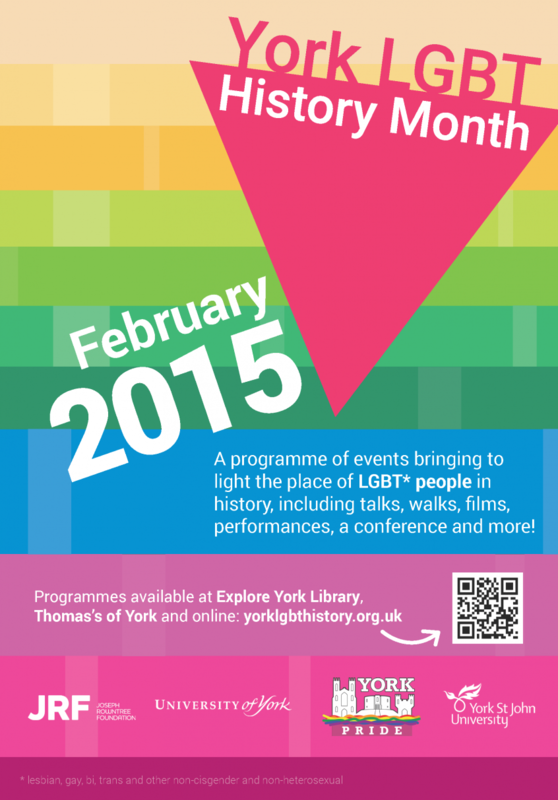 York LGBT History Month 2015 will see thirty events from twenty different organisers. These will include films, a play, variety nights, an exhibition, displays, a reading group, collaborative heritage events, a conference, discussion panels, talks and walks. The month will be launched at an exciting, free event featuring live music from local bands, an exhibition by a local artist, speeches, a quiz and short films including Screen Yorkshire’s award-winning Private Life. A spoken-word and poetry night, featuring a range of acclaimed talent from Yorkshire and beyond, will be the official closing night. Events are detailed in our programme, professionally designed by York resident Vlad Kuzmin. The programme can be found on our website and printed copies will be made available in due course at York Explore Library and Thomas’s Bar York, both on Museum Street. Last year saw the first ever collaborative LGBT History Month campaign in York, spearheaded by York St John University. This was a great success, and resulted in the establishment of an independent organisation called ‘York LGBT History Month’ to coordinate efforts in future years1. Plans are also underway for school outreach work to explore LGBT history narratives within the framework of the existing curricula. We are delighted to announce a diverse and exciting programme of events for 2015, offering a wide variety of ways for the public to engage with LGBT narratives. It’s great to have seen the number of groups, organisations and individuals involved double, showing a real drive in support of our aim to increase public awareness of the place of LGBT people in history. Through bringing to light stories that might traditionally have been ignored, we seek to develop inclusivity, challenge stereotypes and promote understanding. Our school outreach initiative will serve to further reinforce the principle of inclusion at a key developmental stage. York LGBT History Month is kindly supported by the Joseph Rowntree Foundation, the University of York, York Pride and York St John University. Andy Law, Lead Coordinator: led the 2014 campaign as Secretary of York St John University LGBT Staff Network. Andy works at York St John University and is studying an MA at the University of York. Former Secretary of both York Pride (now a Support Officer) and York LGBT Forum, he has been involved with York’s LGBT groups and organisations since 2010. Kit Heyam, Assistant Coordinator: a PhD candidate and postgraduate teaching assistant at the University of Leeds. Kit’s thesis is entitled ‘Literary and historical representations of Edward II and his favourites, c.1305-1700’. They are coordinating York LGBT History Month’s school outreach programme and will be delivering a talk at the University of York as part of the programme. Trudi Jackson, Assistant Coordinator: about to move from the Joseph Rowntree Foundation to York Mind, where she will take up the position of Assessment and Mentoring Coordinator. Trudi has organised the York LGBT History Month 2015 closer. She has a degree in Classical and Ancient Studies and a Postgraduate Diploma in Museum Studies, and is also Secretary of York Pride. Philip Newton, Assistant Coordinator: Assistant Curator at York Museums Trust, based at York Castle Museum. Philip is to jointly host an event where the public are invited to bring in objects, documents and stories that have relevance to LGBT history. He has an MA in Heritage Management and will also be delivering a talk at York Castle Museum as part of the programme. Jonathan Peters liked this on Facebook. Colin McNichol liked this on Facebook. Dasha Giraffskaya liked this on Facebook. Samra Mayanja liked this on Facebook. Anaïs Duong-Pedica liked this on Facebook.